From vintage properties to contemporary homes, almost every style of architecture can be complemented by a carriage garage door. However, traditional carriage style doors are typically heavy, expensive, and a bit cumbersome. Luckily we sell and install high-quality carriage style garage doors in Los Angeles CA that mimic the look of a traditional door but feature a convenient, space-saving roll up design. If the pre-made door options don’t quite meet your needs, we can help you order a custom door with the exact design elements you need. Check out our online design center for a taste of the possibilities. When you invest in a new garage door, you need to protect that investment by getting quality service all the way through, from purchase to installation. If you want to get the most out of your carriage garage doors in Los Angeles CA, they need to be installed properly and professionally. Our installation technicians are highly experienced and you can rely on them to get the job done right the first time. Don’t forget to ask for your free 4-sided weatherstripping with every garage door installation. Need Service for Carriage Garage Doors in Los Angeles CA? Already have carriage garage doors in Los Angeles CA? We can provide maintenance and repairs for both swing-open and roll-up carriage garage doors, as well as for the garage door openers that operate them. Whether you know what’s wrong with your garage door or not, we can draw on our 19 years of experience to help provide a fast and effective solution to the problem. 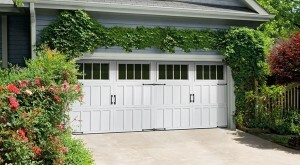 Remember, your special carriage garage doors in Los Angeles CA deserve special attention. We’re happy to provide that attention and we’re only a phone call away.